In the kitchen, one of the most important tools for any chef is a good paring knife. Just like the Chef’s knife, the paring knife is expected to be used daily. This knife is smaller than a Chef’s knife, and it is used for cutting, slicing, and peeling smaller food items such as fruits and garlic. Let us take a look at one of the best paring knives in the market today, which is the Chicago Cutlery 102SP Slant Tip Paring Knife to see what it can do for you and your kitchen. The Chicago Cutlery 102SP Paring Knife has a blade made of high-carbon stainless steel that resists stains, rust, and pits. This means that it will retain its quality despite daily use. It is also made with Chicago Cutlery’s exclusive 25-degree taper grind edge for the best in sharpness. This ensures that the blade retains its sharp edge for a more extended period. Additionally, its slant tip makes it more versatile to peel and slice through various food items. The knife features triple brass rivets and a full metal tang, and the handle is made from walnut wood which makes it comfortable and adds strength and balance to the handle. The walnut wood is made with comfort and security in mind. Meaning the wood is strong enough to maneuver the blade against any item but still soft enough to be comfortably held for a long period. The handle also has a smooth contoured finish to prevent food and germs from sticking to the surface. To add more, the brass rivets in the handle are evenly placed for a well-balanced feel to the knife. This paring knife has a very simple aesthetic. There are no layers or patterns on the blade, just a no-nonsense sharp blade, and a secure and comfortable wooden handle. It’s a very classic look that offers functionality rather than style. The paring knife blade is three inches long, but the entire knife measures 11 inches in length, one inch in height, and three inches in width. As per its weight, it comes in at approximately 0.8 ounces. 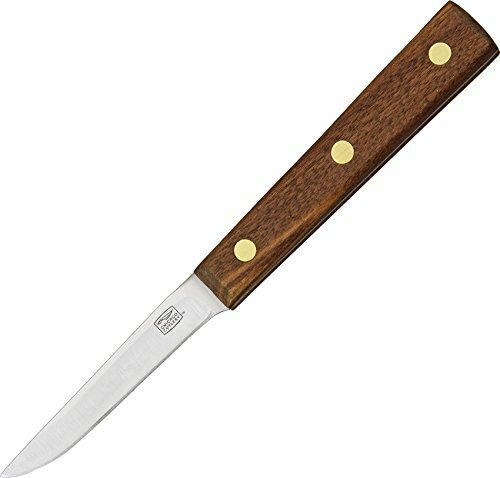 The Chicago Cutlery 102SP Slant Tip Paring Knife is a paring knife with classic style and features. The knife has a three-inch blade made of a high-carbon stainless steel blade. The full tang blade is resistant to stains, rust, and pits, and was made with the exclusive 25-degree taper grind edge by Chicago Cutlery for optimum sharpness. Three evenly spaced brass rivets can be found on the knife’s walnut handle for stability and control. It is also contoured for a better feel and comfortable grip while providing a classic wooden style. The knife also features a slant tip for better maneuverability with meal preparation and kitchen work. Although it is on the affordable price range, this paring knife comes with a full lifetime warranty. Do note though that this knife should be washed manually and sharpened after some time. To see how the Chicago Cutlery 102SP Slant Tip Paring Knife fares, we compared it with other paring knives. First, we compared it to the Moteng Ontario Knives Paring Knife. Both knives are made with a simple design and made of quality steel blade paired with a stable wooden handle with brass fittings. The Moteng Ontario Knives Paring Knife, though, is just a little bit more expensive than the one from Chicago Cutlery. One advantage that the Moteng Ontario Knives Paring Knife is it has a wider blade edge, which makes it better for slicing. Additionally, while both knives offer the same simplistic design, the Chicago Cutlery knife is made with better quality. The knife’s blade has more versatility with the slant tip, and the handle is made with better wood and has a better ergonomic design. The Chicago Cutlery knife has more brass fitting for a more stable and balanced grip. It also offers a lifetime warranty, while the Moteng Ontario does not. While their blades seem similar, the Chicago Cutlery knife is made with better quality and a better design, making it the superior product. Next, we compared the Chicago Cutlery paring knife with the Kurouto VG10 Paring Knife. Both products offer quality blades with sharp edges and a comfortable handle. They are also made with the same quality of steel and a good sharp edge. The Kurouto knife has several advantages, including a more ergonomic and comfortable handle. Its blade is also made with more durable materials. While the Chicago Cutlery knife may not look as flashy as the Kurouto knife, it provides more functionality. The blade is not as tough or durable as the Damascus steel of the Kurouto knife, but it can be used for more kitchen work thanks to the slant edge. The handle is also not as stylish or as comfortable, but the wooden material makes the Chicago Cutlery better for maneuvering around certain food items. The Chicago Cutlery knife is also more affordable than the Kurouto knife. These features make the Chicago Cutlery knife a better paring knife than the Kurouto product. There are several paring knives in the market that feature Damascus pattern blades and ergonomic shape alloy handles. While these blades are of high quality, they can be expensive. The Chicago Cutlery 102SP Slant Tip Paring Knife is a simple knife that gets the job done. It has a solid wooden handle and a great slant-tip blade. It may not offer much in terms of style, but it is a functional knife that can be used for everyday kitchen needs. The Chicago Cutlery 102SP Slant Tip Paring Knife is also one of the most affordable knives in the market. You can easily find a better knife, but not with the same quality at this price range and lifetime warranty. Simply put, don’t let the price tag fool you, as it does not take away from the quality of the Chicago Cutlery 102SP Slant Tip Paring Knife.